So I am sitting in the abyss and going through my email, and I see that Newton's Nook is having an Inky Paws Challenge starting today. So, why not enter. 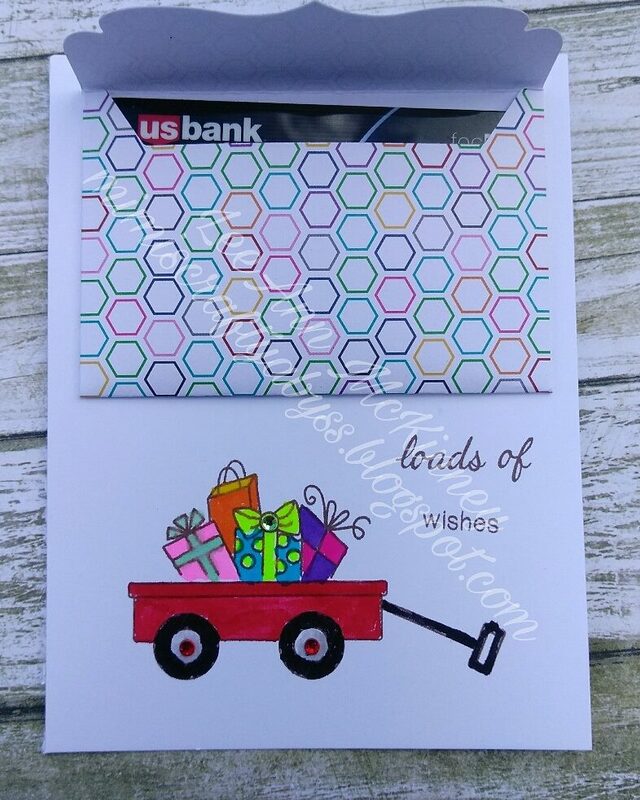 I grabbed the Wagon of Wishes set and went to work on this clean and simple card with a gift card holder attached. I will use a glue dot to hold the holder closed. Very cute gift card holder with such colorful presents! We would love to know the age of your stamp in order to be eligible to be picked as one of our Top Picks. Thank you for playing along with our color challenge at Retro Rubber and hope you will join us again soon! Awwww... this wagon of presents is so sweet! And it pairs with the gift certificate so well!! Thank you so much for including the age information for your stamp image! We love getting our more vintage rubber stamps back out to play with! Hope to see you often in our gallery! LeeAnn, this card is adorable....live the little red wagon with the gifts that coordinate so well with the color challenge. I love how you added the gift card holder too. Thanks again for playing along with Retro Rubber challenge. Love, love this little wagon filled with gifts, so cute and perfectly paired with your gift card holder, what a great idea!!! Thank you for playing along with our RETRO RUBBER color challenge, I hope you join us again next time. The paper you've used for your gift holder is just right for the colour challenge. The wagon of gifts is coloured nicely to co-ordinate too. Thanks so much for joining us at Retro Rubber. Such a cute little project! Thanks for joining us the Inky Paws Challenge! Oh, this is so cute, especially with a gift card enclosed! Thanks so much for joining us at Inky Paws Challenge!